The Ramada Hotel Weimar enjoys a quiet location in Weimar with best transport connections. The friendly four-star hotel offers fair value for money and top hotel services: For a fee of 3 € guests can use the parking spaces at the hotel. Ideal for hotel guests with a car: The proximity to the A4 motorway. The 194 rooms of the Weimar hotel are decorated in a light and friendly style. All the rooms of the Ramada Hotel Weimar have a minimum size of 20 sqm, the spacious business rooms measure 40 sqm. Large windows, modern fittings and comfortable beds ensure a really comfortable night's sleep. Some of the hotel rooms are fitted with a balcony and air conditioning. The hotel offers a restaurant with a garden terrace, a bar and a spacious wellness area with a pool, sauna, steam bath and massage treatments. 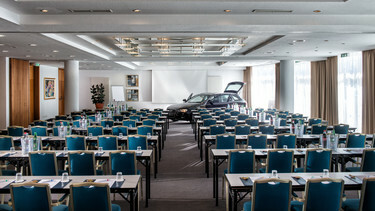 The Ramada Hotel Weimar provides the perfect setting for meetings, seminars and conferences in Weimar. 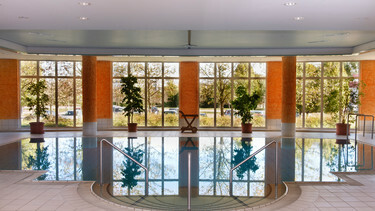 The 750 sqm function area with 10 modern and flexible function rooms can house up to 350 people. The hotel's spacious, green outdoor area is perfect for incentive programmes and conferences surrounded by greenery. Our dedicated and professional event service is happy to support you in planning and organising your event.